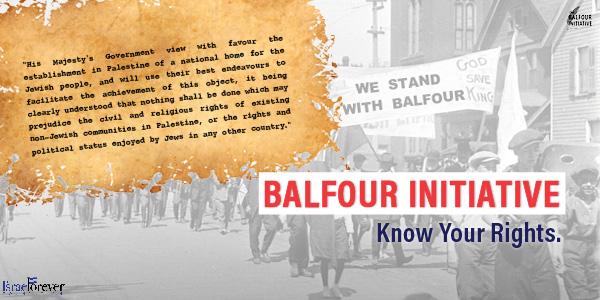 Amidst the growing tension over the pending centenary of the Balfour Declaration, The Ministry of Foreign Affairs outlines 6 facts surrounding the event and its significance and relevance at the time of the declaration’s emergence into the public sphere. 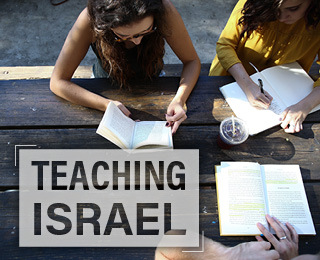 Whether you are a history buff, an avid Israel advocate, or just want to have the facts straight, here are the cliffnotes to help you out. 1. The Jewish people are indigenous to the land of Israel and have had a continual presence there for millennia. Jews have been striving to reconstitute their national homeland since the destruction of the Judean Kingdom in 70 CE. The successful fulfillment of this goal began in the 19th century. 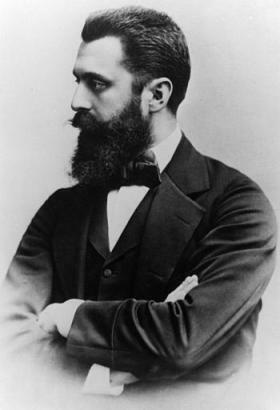 As conceptualized by Theodor Herzl in his book “The Jewish State” in 1896, the political movement to return to the Jewish homeland began to establish national institutions at the Zionist Congress in 1897. 2. 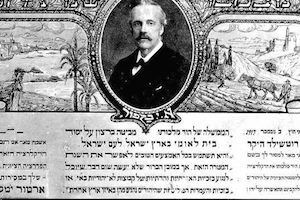 The Balfour Declaration was one of the earliest measures taken by a major international actor to recognize the right of the Jewish people to re-establish sovereignty over their national homeland. 3. International recognition of the Jewish people’s inalienable right to reestablish sovereignty in its ancestral homeland quickly followed the Balfour Declaration. 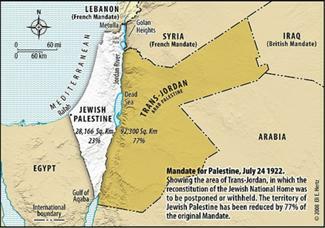 Most significantly, the League of Nations [the precursor to the United Nations] recognized this right in its 24 May 1922 decision to establish the Palestine/Land of Israel Mandate. 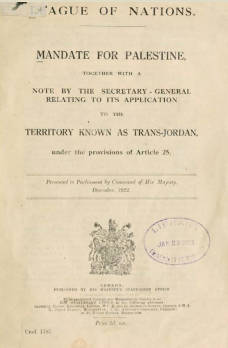 In that international legislative act, the League appointed Great Britain to be responsible for putting the Balfour Declaration into effect, with the goal of “the establishment in Palestine of a national home for the Jewish people.” The legally-binding League of Nations Mandate acknowledged the “historic connection of the Jewish people” to the area rightly known as the Land of Israel/Judea/the Holy Land. The League of Nations mandate of 1922 transformed the Balfour Declaration and its call for the establishment of a national home for the Jewish people from a policy position into an international legal obligation accepted by the international community as a whole. 5. 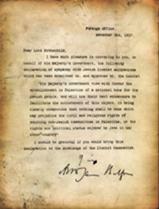 The importance of both the Balfour Declaration and the League of Nations decision lays in the international recognition of preexisting natural, historical, and legal rights of the Jewish people to their homeland, in which there had been a continuous Jewish presence throughout the centuries. 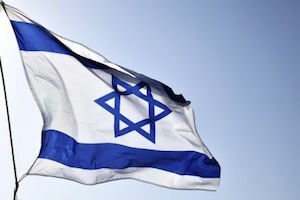 The official acknowledgment by the international community of the Jewish people’s historic ties to the land is further emphasized by the language used in the League’s Mandate decision. The Palestine/Land of Israel Mandate specifically calls to “reconstitute” the national home of the Jewish people, not to constitute anything new. 6. 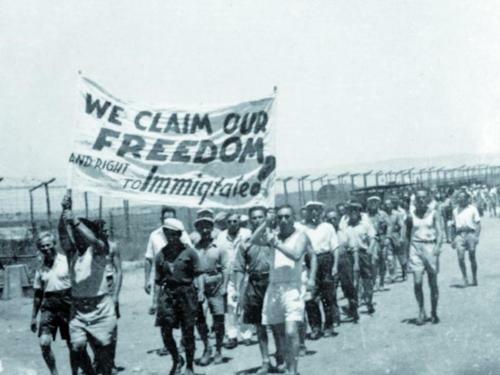 The Balfour Declaration, the League of Nations decision and the subsequent United Nations Partition Plan of 1947 all recognized the Jewish people’s right to a sovereign state in its historic homeland. These international decisions played an important role in galvanizing support for the establishment of the future State of Israel. Jewish rights to our ancestral homeland are unassailable. 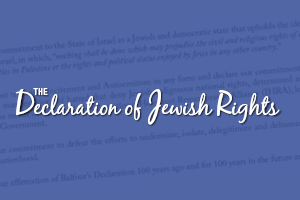 Learn about the Balfour Declaration as a symbol of Jewish legal rights and an important milestone to sovereignty in the Jewish homeland.